Okay...So with double shifts at the Nook this past weekend (one on Monday and one on Saturday), the 4th of July, and watching my parents’ dogs the week somehow just slipped away from me. For the one or two followers out there on the interweb, I sincerely apologize for the delay in my commentary. So without further ado, here is this week’s recipe. 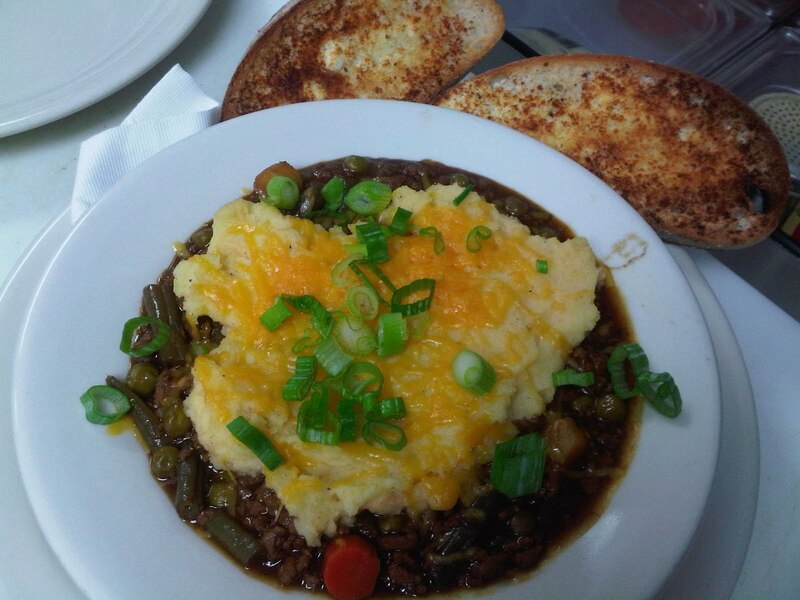 This is a scaled down version of the Semi-Sober Shepherds Pie we featured Saturday July 9, at the Nook. Enjoy! This dish combines ground lamb, ground chuck, and assortment of vegetables with a good helping of beer in a thick stew, which is then covered with a generous mashed potato crust and baked until the flavors of the hearty ensemble have become one. I know that this wonderful dish isn’t for everyone. My father often refers to it as “lava pie” because of the way the sauce bubbles over, and he absolutely refuses to eat it. For those whose only contention with this dish is the lamb, simply substitute it for ground chuck. Though try the lamb, at least once, you may be surprised. 1. In a large stock pot, place the potatoes and salt and cover with cool/cold water. Heat on the stove on high until boiling. Cook for approximately 20 minutes or until fork tender. 2. Drain the potatoes in a colander and combine with the butter and milk. Mash with a hand mixer until creamy. Reserve mashed potatoes for later. For extra creamy potatoes run the cooked spuds through a food mill or potato ricer prior to combining with milk and butter. 3. In a large skillet on medium-high, cook the diced pancetta until crispy. 4. When the pancetta is crispy add the ground chuck, and cook until browned. Remove from skillet and drain off liquids/ fats. Make sure to reserve some of the cooking fat in the skillet. 5. Brown the lamb in the skillet. Remove and drain off liquids. 6. Place the lamb, beef, and pancetta in the bottom of a lightly greased large, deep casserole dish or similar oven proof baking device. 7. Cook the carrots and parsnips in the same pan on medium heat (adding more oil if necessary) for approximately 3-5 minutes. Add the onions and cook until everything is tender. 8. Add the tomato paste to the pan, and mix until evenly distributed. 9. Add the flour to the pan and continue to stir until slightly browned. 10. Deglaze the pan with the beer, and cook until reduced by ½. Add the Worcestershire sauce, rosemary, and thyme. Stir to mix. 11. Pour the mixture over the meats. 12. Add the green beans and peas to the casserole and mix the contents just enough to combine. 13. Cover the dish with the mashed potatoes (top mashed potatoes with shredded cheddar cheese if desired). 14. Bake at 400 F for 20-25 minutes until the potatoes have browned.